Patrick Brice does not want you to spend the night at any stranger’s place. Notable only for being exceptionally forgettable, his second film, The Overnight, chronicles the mounting awkwardness a yuppie dinner party turned sleep-over, at least as far as anyone can recall. For some reason, it has played just about every major festival, even though the only memorable thing about it are the jokes about the guy who isn’t Jason Schwartzman having tiny junk. However, you will definitely remember Mark Duplass is the title character of Brice’s first feature, Creep (trailer here), a Blumhouse BH Tilt production, which opens its belated premiere theatrical engagement this Wednesday at Videology in Brooklyn. Like Safety Not Guaranteed, this Duplass film also starts with a classified ad. It seems a well-to-do dude requests the services of a videographer to film him over the course of a day. It pays $1,000, but “discretion is appreciated.” You don’t say. When Aaron arrives for the gig, Josef tells him he is dying from a brain tumor, but wants document how he really was for his unborn son. His inspiration is the Michael Keaton movie My Life. That alone should raise Aaron’s suspicions. In fact, it does not take long for the video freelancer to conclude there is something very off about his client. Josef’s family vacation home is also unsettlingly remote. Nevertheless, one grand is one grand, so he sticks with it. At first, Josef just seems annoyingly eccentric, but he eventually tells Aaron some pretty whacked out stuff. Clearly, Josef is playing some sort of game with him. Unfortunately, viewers will have a better idea than Aaron where it is all headed, because they know they came to a horror movie. Yes, this is a found footage film, but given the set-up, it makes sense to have all the bedlam documented on Aaron’s camera. Frankly, there is nothing radically original here, but it is seamlessly cut together by editor Christopher Donlon (fortunately, narrative developments allow for and even require a bit of snipping together). As a result, it is a tight film dominated by Duplass’s performance. He is massively creepy, so to speak, always just peaking over the precipice of camp, without ever plunging over the top. Brice and producer-horror mogul Jason Blum owe a major debt of thanks to the owner of that mountain home. Its staircase is likely to become iconic among genre fans. Of course, Blumhouse does plenty of this sort of thing. They did not invent the found footage sub-genre, but one could argue they took it to the next level, nearly cornering the low budget studio market in the process. This is one of the better examples, powered by Duplass’s unabashed scenery chewing. 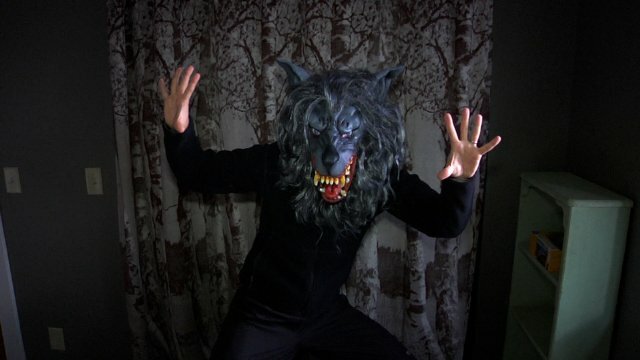 Recommended for fans of Duplass and Blumhouse, Creep opens this Wednesday (9/2) at Videology (but it is also already available on VOD and even streams on Netflix).